This promo is exclusive to users who have access to GSave Beta and have received the SMS. The transaction must be done via the GSave feature using the GCash App. To join, users must be registered to GSave and deposit at least P50 in their GSave account. Upon depositing, users get a chance to win any amount between P10 and P50,000 at the end of the week (Sunday). An individual user can avail of the promo a maximum of once per week. Prizes will be sent via GCash to the winners’ GCash wallet throughout the promo period. All you need to do is open a GSave account, deposit any amount to GSave, and get a chance to receive win up to P50,000! Get more from your savings with GSave! 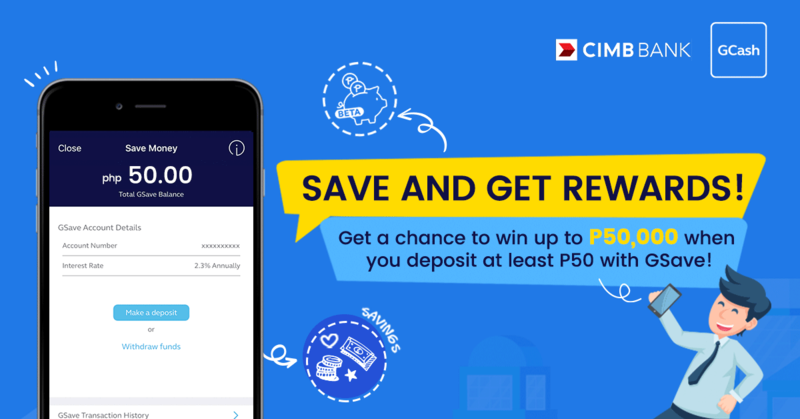 Enjoy cashbacks up to P50,000 when you deposit at least P50 into your GSave account. Avail of this promo every week until April 5, 2019! Tap Show More in the GCash app and select Save Money to get started! Per DTI-FTEB Permit No. 3595, series of 2019. No advisories? Text STOP to 2682 for free. The promo period is from March 11 to April 5, 2019. How much can a winner receive? A raffle winner can win up to P100,000 and is only eligible to one surprise deposit. When will I receive the surprise cashback? If you are entitled to the promo, it will be seeded to your GCash wallet not later than April 5, 2019. How will I know if I have received my surprise savings? How can I claim my surprise savings? The additional deposit will be seeded 3-5 working days after every end of week per week of the March to April 5. GCash is a BSP-regulated mobile money service open to all networks that lets you buy load, purchase items, send and receive money, pay bills, and access to financial services (Investments, Credit Line, Savings). How do I create a GCash account? 2. Enter your mobile number and click Register in the prompt. 3. Provide the necessary information as prompted. 4. Nominate a 4-digit MPIN. Note: Your GCash mobile number must be the activated SIM in your phone to ensure a successful in-App registration. 3. Nominate a 4-digit MPIN. 4. Provide the necessary information as prompted. GSave is the digital savings account in partnership with CIMB Bank, available on the GCash Save Money feature. This service allows users to save money with zero maintaining balance, zero initial deposit, and earn from their savings with 2.3% interest rate. How do I verify my GCash account? If promo will be sent via GCash wallet, how do I get the money on hand? If you have a GCash card, you can withdraw the money through any BancNet or Mastercard partner ATMs. If you don’t have a GCash card, you can get a card for P150 delivered straight to your doorstep through this link. Can I get the prize in cash instead of GCash? Sorry, you can only receive the prize through GSave. GCash is accepted in 25,000+ partner merchants nationwide, offers 350+ billers, and access to our newest financial services products so you can easily use GCash by simply downloading the free GCash App. Your prize amount will be sent to your GCash wallet between March 11 – April 5 2019, three-five working (3-5) days after each end of week. Winners will be chosen at random, and users can win as long as 1.) they deposit 1 a week during the promo period, 2.) they have not already won any amount from P10,000 to P50,000 during the promo period. How many times can I participate in the promo?